I have discovered what I believe to be the only downside of attending an IPP – ignoring for the sake of argument the handy shortcut to poverty it provides – and that is the fact that there is just so much to blog about, so many new puzzles to acquire and play with, that you don’t write about the other events after it! So here I find myself having returned from IPP in August, attended MPP7 on the 8th of September (see how we did that without even trying: MPP7 on the 8th of the 9th! - unless you're American... ), having gone to a Gathering for Gardner at Laurie’s place this past Saturday and about to head out to the official MPP8 next Saturday at the Dutch Cube Day in Holland ... and I still haven’t blogged about the last MPP ... highly remiss!! 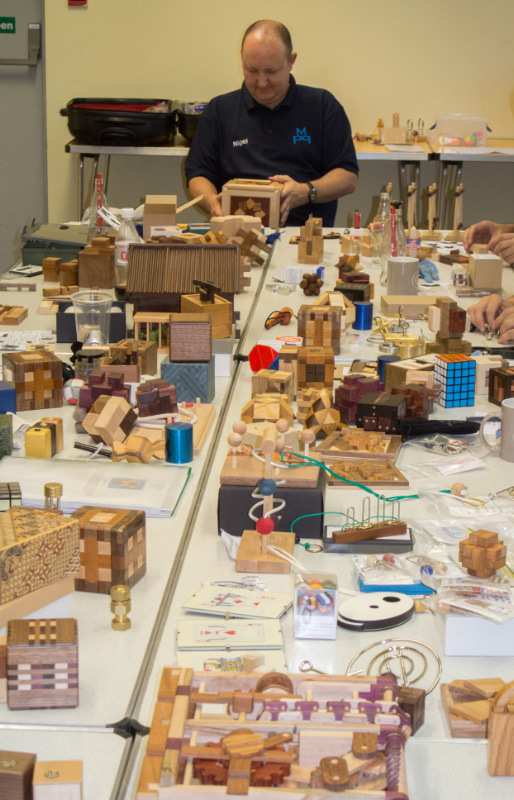 MPP7 followed the usual recipe of emails out to all the usual suspects, some posts on the Revomaze forum inviting all comers and some personal appeals to all the new UK puzzlers I met at IPP. Nigel took care of the arrangements and we had a sizeable room in the Warwick community centre that we’ve used a few times in the past. He laid on the usual assortment of hot drinks and the trusty MPP kettle did great service on the day. 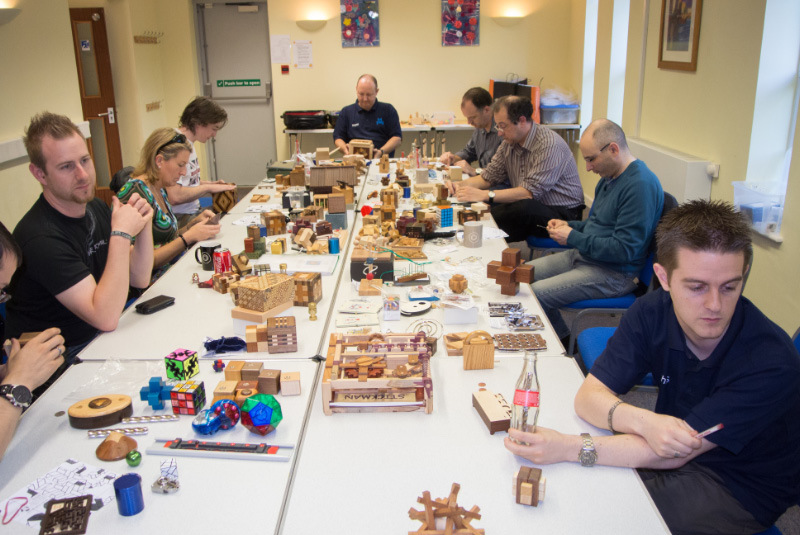 Previously we’d arranged the tables around the edges so we ended up unwittingly with folks sitting facing the walls with their backs to one another solving puzzles (OK, it wasn’t quite that anti-social!) but this time we set up one long wide table in the centre of the room and everyone crowded around it – so the natural inclination was to sit facing one another the whole time – much better! More opportunities for banter and blogger-baiting (insert name of favourite blogger-target here!). 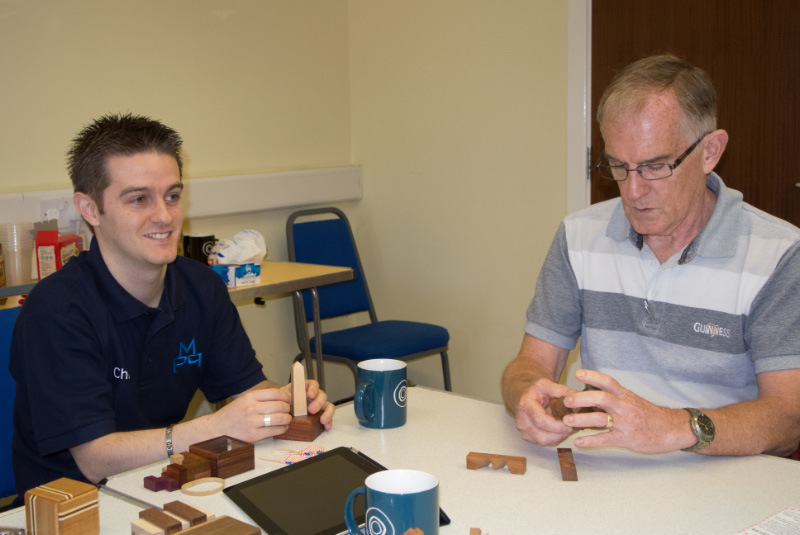 Chris had brought his dad, also a keen puzzler, along for the day and he threw himself into solving a goodly number of serious challenges ... including one or two that I’d brought along because I hadn’t been able to work them out yet! One of those was Wil’s IPP Commemorative Cola Bottle that I’ve already written about – he launched himself into that one with no signs of fear at all. I’d been eyeing it out for a couple of days thinking to myself “I’d better not take that one apart in case I can’t put it back together again before Saturday and Wil’s asked me to show it to everyone”! 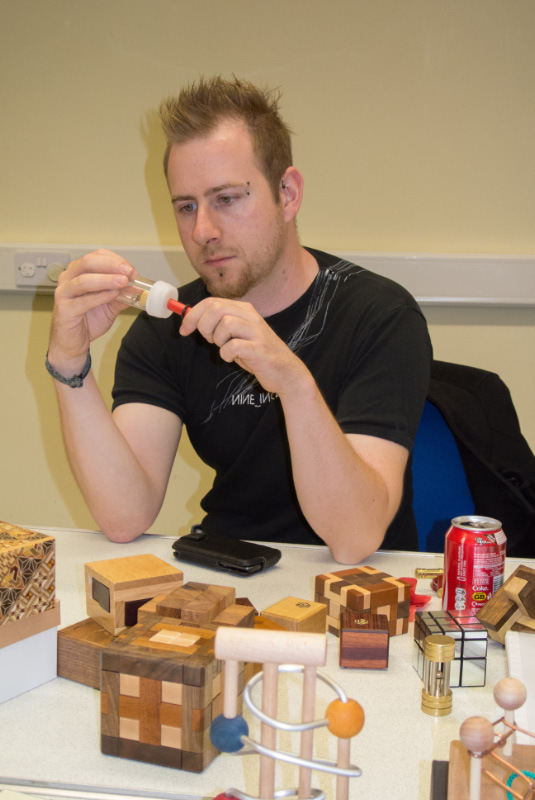 Similarly he made really short work of Coffin’s Rattle ... the man is a puzzle-solving machine – and I’m guessing that some of it runs in the genes – because that would definitely explain some of Purssell junior’s prodigious puzzling powers! I’d taken my copy of the Stickman Milestone Puzzlebox and few folks managed to work their way through it and then leafed through the book as a prize for opening it – and it was interesting to see that everyone spent quite a while tracing around the mechanism and testing little movements before they eventually found the “first move” – and then loosened up a bit and enjoyed playing the mechanism backwards and forwards. Nigel had his Super-Cubi and King-Cubi there and for a while the room was filled with gentle click-clacking as Rich worked his way through 1536 moves in one direction, and then the same again in reverse ... and Nigel gave us an impressive demonstration of just how fast it can be done – but he’s had a little practice! We were joined for the first time by Frank Potts who I’d met in Washington DC. 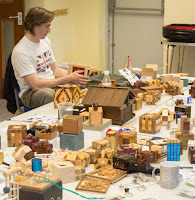 Frank arrived with a suitcase full of puzzles for sale or exchange (Yes, we all descended like gannets!) 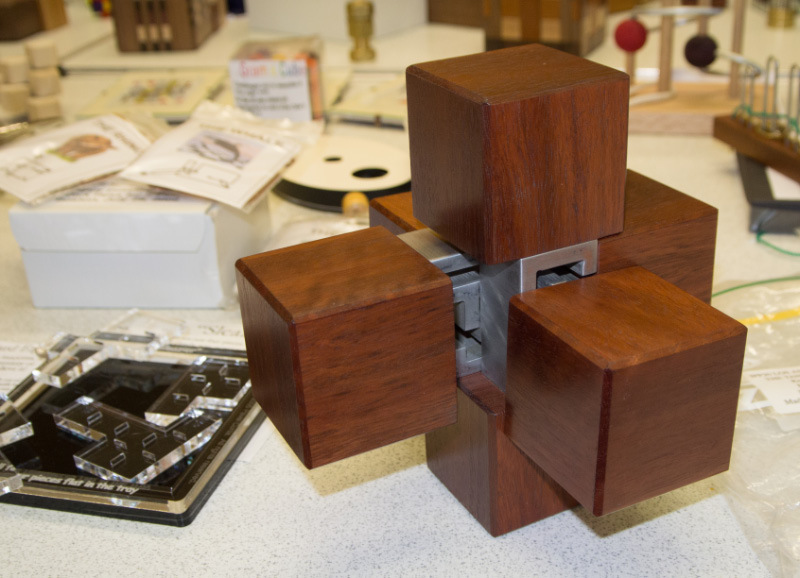 as well as a couple of special delights for us to play with – one of which had been on my “To be lusted after” list for a while – The Minotaur’s Burr – his own design made by Brian Young as a limited edition in 2009. One of the scariest things I saw at MPP7 was the sight of Rich demolishing and then rebuilding some very high level burrs, and then talking about playing around with monsters like Tiros and Lange Wapper like they were old friends... that guy is fearless when it comes to high level burrs – taking one of them apart, mixing up the pieces and then rebuilding it while holding a conversation with the bloke opposite him... very scary! Adin had good time playing with a copy of Wil’s Exchange Puzzle ... Joe spent a while on a copy of the Plugged Well and Kevin managed to find a couple of entanglements he didn’t already have among Joe’s haul. One puzzle did come away totally unscathed on the day: I’d taken a copy of the Six of Diamonds along as I’d had absolutely ZERO success at it until then ... and a few good folks had a bash at it and retreated, leaving it in bits for the next person to attempt it ... and a couple of months later, it’s still unassembled – and I suspect that I might need to trouble one J Dalgety for a solution to that one... it is a monster! 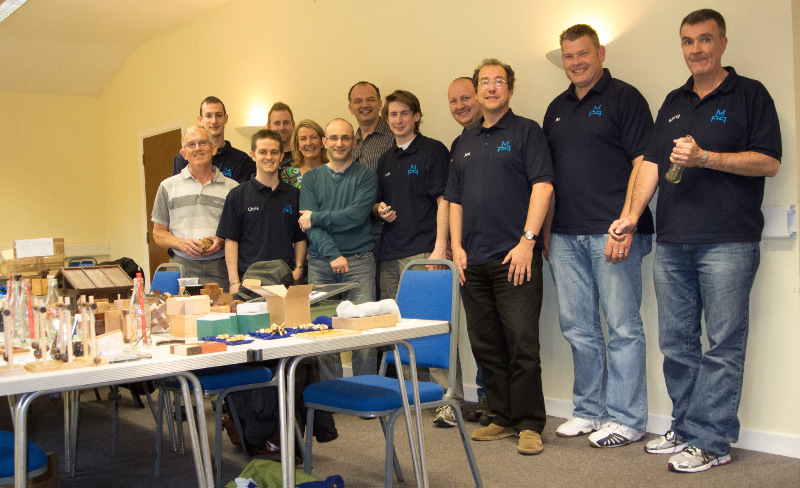 Another excellent day’s puzzling – superbly organised by Nigel and thoroughly enjoyed by the rest of us! Thanks mate! 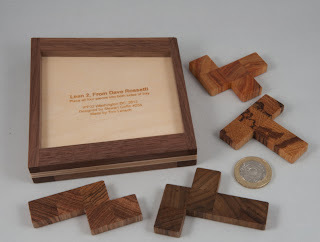 Dave Rossetti’s Exchange Puzzle at IPP32 was designed by Stewart Coffin (design # 255 if you’re counting!) and beautifully made by Tom Lensch. 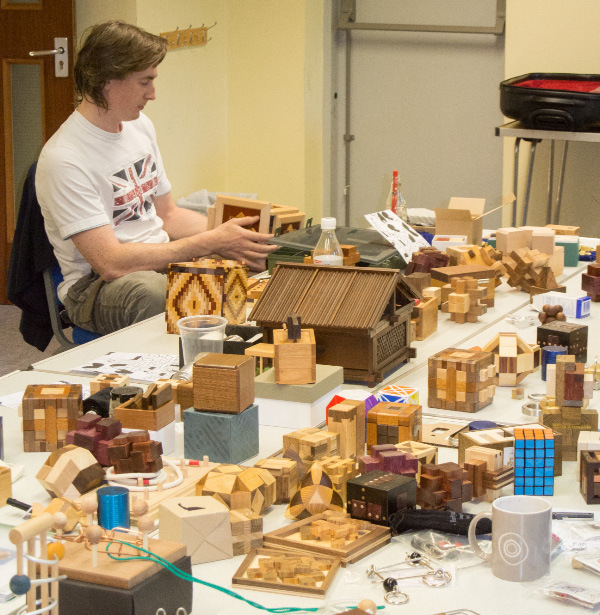 This was one of the puzzles I’d spotted during the exchange that I needed to track down on the Saturday ... and luckily Tom had a few spares for sale. It’s a one of those beguilingly simple-looking puzzles –four different pentominoes to fit in a tray that looks well over-sized for the four little pieces ... this one comes with a small twist in that the name not only refers to the shape of the tray (which looks like the cross-section of a simple lean-to structure) but it is double-sided and the opposite sides are narrow and fat respectively and they’re swapped around the reverse side ... giving you two trays to solve ... and before you ask, no, the same solutions won’t work on both sides! 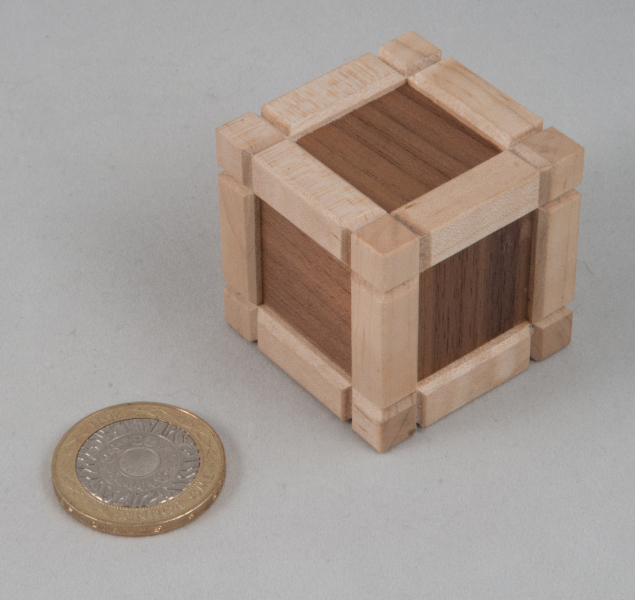 I followed my usual approach for these sorts of puzzles (hard ones!) of leaving it on the desk in the study and having a go at it every now and then ... over the course of a couple of weeks ... and that’s what it ended up taking me – weeks! Toward the end of that little journey, I’d managed to find a satisfactory solution for one side (and taken a hasty photograph of it!) and then switched to the other side, which then took quite a while ... along the way I found a sort-of-solution that fitted into the frame, albeit rather tightly, and with a couple of little gaps in among the pieces – but I decided that was unlikely to be the solution as it wasn’t ‘elegant’ – and I think Stewart Coffin’s puzzles should all have elegant solutions. 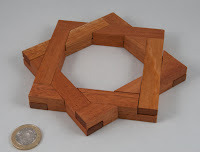 I had a chat with Nigel who’d confessed to having solved his already and he agreed that gaps probably weren’t desirable ... so I spent another week or so fiddling with it every now and then until I eventually managed to bungle across an elegant solution – no gaps and the pieces are a loose fit in the frame. Victory! In fact solving that second side felt that good that I felt the need to announce it on Facebook – which took some folks by surprise as it was just about the first thing I’d said on there in a years! 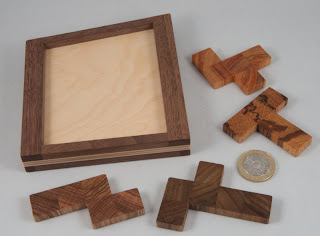 Tom has done a great job on this puzzle – the pentominoes are each made in a different hard wood and the tray has the puzzle’s details etched on the one side so you can’t forget what it is! And it goes without saying that it’s another cracking design from the legendary Stewart Coffin! 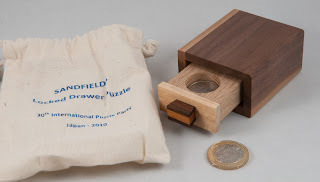 This brilliant puzzle was Robert Sandfield’s exchange puzzle for IPP30 in Japan. 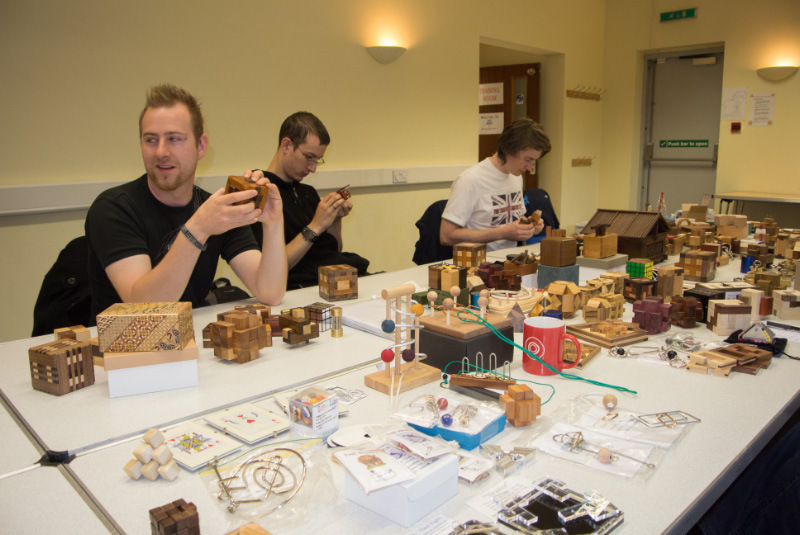 It’s beautifully made by Kathleen Malcolmson who also had a hand in designing it... and when I saw a few of them on Robert’s table at the best puzzle party (cue Jeremy Clarkson tone) in the world, I took one straight away (and paid for it as well!). It comes in one of the usual Sandfield-branded draw-string bags and it’s a reasonably unassuming little box with a drawer on one side of it. Something inside rattles, a bit like a coin. 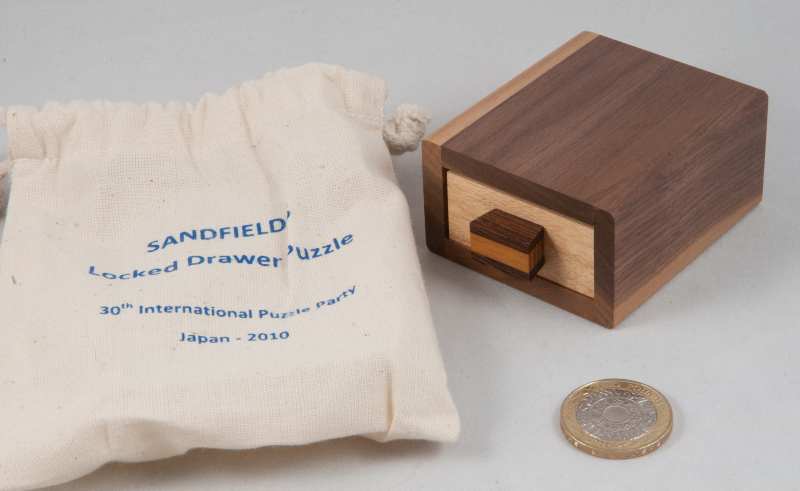 The drawer is a bit looser than I’m expecting given the puzzle’s name, in fact you’ll find that it pulls right out – which is a real surprise given that it’s Sandfield’s Locked Drawer – until, that is, you pull it all the way out and there’s a little click, at which point you realise you’ve been had ... NOW it’s locked – locked OPEN! ...and that’s the start of the little odyssey... you have an open drawer with a coin in it, assuming you didn’t open it upside down, in which case there’s now a coin on the table! Try turning it upside down, spinning it, or even blowing gently on it, nothing seems to help. Shaking it brings up some new noises though... intriguing – where was that before? From there on there’s a great little journey of discovery to find a few useful tools, some hidden places, a weird mechanism that won’t do what you want it to ... until you understand it and then ultimately a series of steps to return the box to its original state, ready for the next victim. 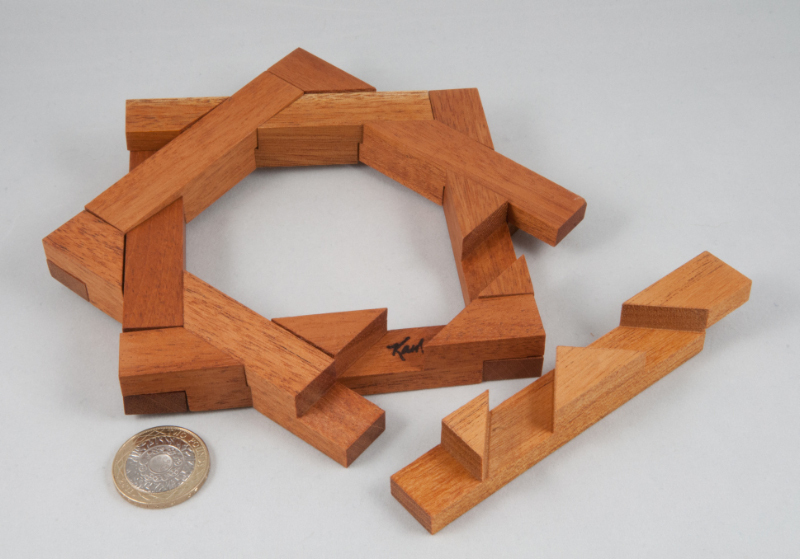 A beautifully disguised little sequential discovery puzzle that packs way more discovery than I was expecting – and I love giving it to folks and telling them what it’s called and watching the look on their faces range from “That’s not a puzzle, it just opens” to “Oh ... bugger!”. I met Peter Wiltshire for the first time in the bar of the hotel on the Wednesday evening at IPP32. I’d ‘seen’ him on the Renegades forum as Arc Light where we’d swapped the odd comment about puzzles and puzzling, but this was the first time we’d talked, and within minutes of being introduced to him, he’d given me a copy of Hidekuni Tamura’s Sway Cube that he’d made in maple and walnut. 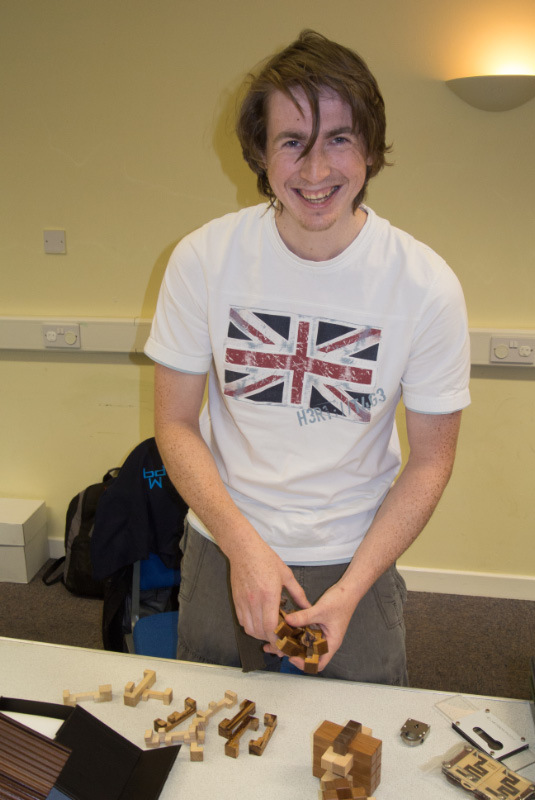 He explained that at his first IPP, Ginda, one of the IPP veterans had given him a copy of her exchange puzzle because it was Peter’s first IPP, as a way to welcome him to IPP and in the hope that he might continue the tradition of giving first timers a copy of your exchange puzzle ... now even though Peter wasn’t actually exchanging his own puzzles this year, he’d made up a few copies of the Sway Cube and was presenting them to some of us newcomers ... gosh! I sat and fiddled with it this way and that and didn’t get very far at all ... at one stage I voiced a theory that the rattling inside was just there to put me off and Peter just smiled ... I finally managed to open it later that evening in the hotel room – and I was wrong – dead wrong. Stephen Chin, or Chinnomotto, is another Renegade I’d been looking forward to meeting at IPP. Chinny is a dentist form Australia known for his awesome lathe-working skills and wicked sense of humour. He’s been making off-beat puzzles for years, often cannibalising the electronic bits from musical greeting cards to add a little surprise to his puzzles. This year’s entry in the Design Competition was a little mouse house that nipped your finger when you did the obvious and then you had to listen to the mouse inside the house laughing at you! :-) Classic Chinny! One evening in the competition room Chinny gave me his last mini wobbly top ... he’d been writing about creating these little beauties on the forum and everything I’ve read about them talks about the (literal!) 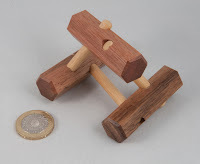 dangers in producing them – after all you have to deliberately put the wood off centre in the lathe and then work the spinning projectile-to-be while it’s trying to free itself from the chuck – that takes a special sort of nutter! Step up to the plate master Chin! 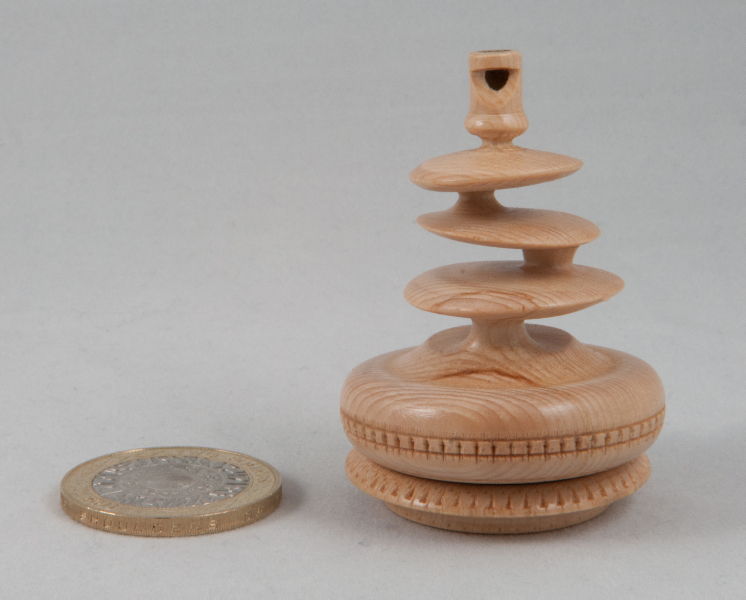 The detail on this little top is astounding: three off-centre spindles supporting three lop-sided and off-centred plates, culminating in the little Chinny trademark whistle in the top, complete with decorative chattering around the base and on the delicate little reversible stand. Spin it and look at it from the side and it looks like a blur, with what looks like a pair of spindles while the whole thing gently wobbles around. Totally unique – entirely Chinny. Thanks mate! I met Ginda Fisher (the one that Peter blamed for that tradition above! 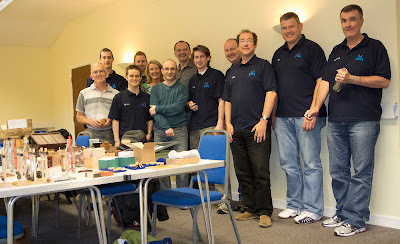 :-) ) while Nick Baxter was sorting out how to get the Design Competition entries back to their respective creators. I’d read somewhere that she was also an actuary, so we chatted a little about our respective lines of work. Later that evening after the Awards Banquet she came over and presented me with a copy of her IPP29 exchange puzzle, Trickier Trivet. This lovely puzzle was made by Kathleen Malcolmson in mahogany (I think!) and it consists of a pair in interleaved squares, with each side being a separate piece of wood. The series of notches as the various crossings and intersections are designed so that there’s one way to assemble this trivet properly ... and I can attest to the fact that there are a lot of ways of almost assembling it – getting seven pieces assembled only to find that the last piece is the wrong shape... and even when you do find an assembly that should work for the last piece, sod’s law says that you can’t finesse that final piece into place, so you need to chase the pieces around the circle one at a time until you get to the one piece that you can insert at the very end ... it’s a really cute puzzle, and as Ginda pointed out, you can actually use it as a trivet in the kitchen! 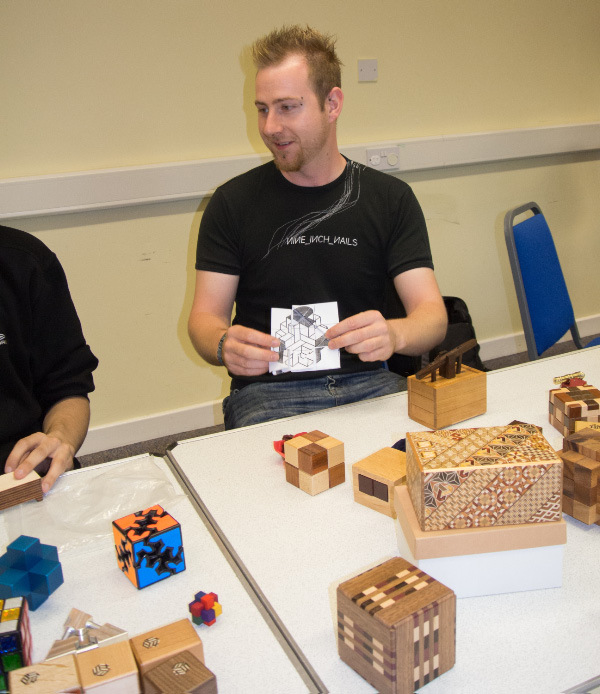 I also met Brian Young, aka Mr Puzzle at IPP32 for the first time, we’d chatted a bit in the Competition Room and I’d given him one of Louis’ impossible cards, then at the Founder’s reception he came barrelling across and proceeded to shower me with puzzles, including a wonderfully simple, irritatingly hard Stewart Coffin design. It consists of three identical hex sticks (OK one has a Mr Puzzle brand on it, but the shapes and holes are identical!) 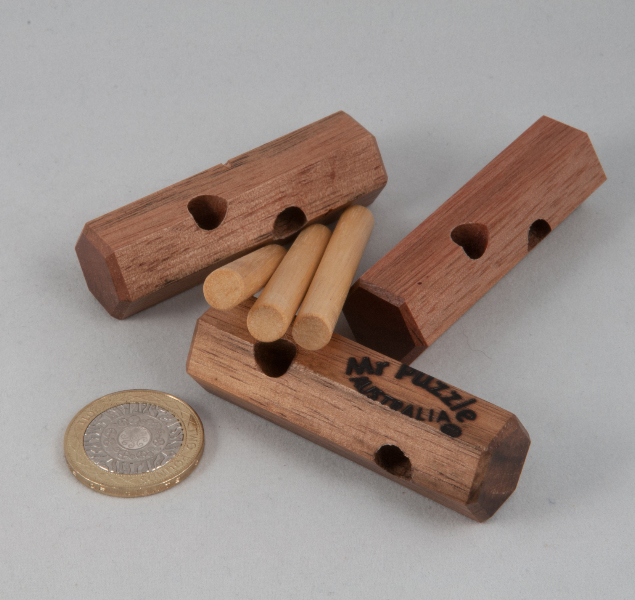 and three dowels ... even though they come with no instructions, you inherently know that you’re supposed to build a structure that has the dowels through the holes in the hex sticks and you’ll know when you’ve found it! I spent ages experimenting and getting nowhere fast – the one structure I had managed wasn’t at all satisfactory and I knew it couldn’t be the answer, and it was only when one of the better puzzlers at MPP had a crack at it and came up with a far more pleasing structure that I was pretty sure that was the right answer ... when I got in touch with Sue, she told me that is was Stewart Coffin’s design 81A, a variant of the Nest Construction set #81 ... and that the description was: “As simple as it gets. 3 sticks and 3 dowels. Go together one way, or two stick and two dowels another way. A few made around 1988.” So not only had I not been able to find the main solution, I’d totally missed the fact that there’s a construction for 2+2 as well – and it’s just as neat!